I read this article and found it very interesting, thought it might be something for you. 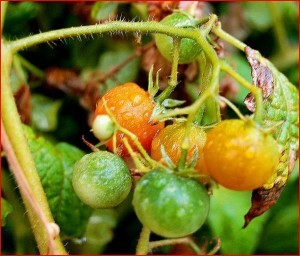 The article is called Grape tomato recall after salmonella detected and is located at http://www.imperfectparent.com/topics/2011/12/03/grape-tomato-recall-after-salmonella-detected/. Front Row Produce of St. Louis is recalling grape tomatoes after random testing revealed the presence of salmonella. In a random testing sample, Rio Queen Citrus has prompted a recall of grape tomatoes after detecting the presence of salmonella. Photo via Wiki Commons. Packages of 10 ounce pints as well as 10 pound bulk tomatoes distributed by Rio Queen Citrus of Mission Texas are affected by the recall, and are available in stores and from wholesalers in Illinois and Missouri. Produce under the recall in the pint size variety will have a green lot sticker on the package. The recall was prompted by testing at Rio Queen Citrus. No word has been given regarding the bulk grape tomatoes, however according to their website, ” This third generation, family-owned business has grown into one of the leading shippers of citrus and produce in South Texas with wholesale trade business spreading across the U.S. and Europe.” Production at Rio Queen Citrus has been put on hold while company officials and the FDA look in to the source of the salmonella contamination. This is not the first time this year that grape tomatoes have been recalled due to salmonella. In May a nationwide recall was launched due to a supplier Taylor Farms, of California distributed “loose” tomatoes for a variety of uses like bagged salads in a variety of store and name brands across the country. A current list of all the FDA food related recalls can be found here. Customers who have purchase recalled tomatoes are advised to cal Front Row Produce at (314) 241-4700, Monday- Friday from 7am-4pm, Saturday- Sunday from 7am-12pm. We always hear the media go wild when a plant has salmonella but we should remember that animal products are the number 1 source of this dangerous pathogen. 17.8% of all turkey meat sold in the US is contaminated with salmonella. Check out this non commercial, science based website that goes into detail.